I know it's not December yet but it's pretty close and I'm excited about Christmas. 32 days until Christmas everyone!! The day were you can sit in your PJs and watch The Muppet Christmas Carol whilst polishing off a selection box with no guilt. I've been trying to make a lot of my Christmas presents this year, I've bought all my Secret Santa gifts and I've only got a few things to tick of my list for the family so I think it's time to treat myself to a few festive gifts. I'm on the hunt for a Christmas day dress and this one from Ark (who also sell things like Criminal Damage Womenswear) fits the bill. Demure enough to wear when the family visit but still fun with the lace detail. The cute necklace is from Punky Pins. I've already got a cute deer necklace and snow man earrings on the way from them but I'm tempted to get this necklace too. They also sell lots of personalised gifts which would make great stocking fillers. I've wanted a Crown and Glory bow for a long time, I love these cute little ones but hey, it's Christmas so I may as well get a giant green one to go with my red dress. I can't believe I've never read A Christmas Carol, I watch so many Dickens adaptations but I've never really taken the time to read this. I've got a kindle so I can get a copy for free from Project Gutenberg but I do love this clothbound classic version which is available from Penguin. I might make a start on reading this on the coach to London and back tomorrow. 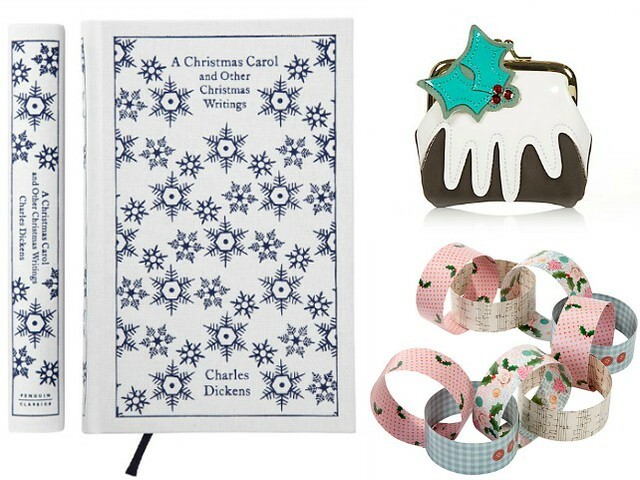 How adorable is this Christmas pudding purse?! I don't need it but it's so darn cute and it's perfect to pop in a clutch bag for a party rather than taking your huge purse with all the receipts and loyalty cards in. We don't have any children in the family so the decorations at my house are a little subdued now. Long gone are the days of garlands hanging from the ceiling and tinsel everywhere. I still want to get into the Christmas spirit and spruce my house up a bit but my mum wont let me get any decorations that aren't cream or gold so I'm going to get make some Christmas paper chains like these ones from John Lewis for my room. Hope you get some lovely things!